The less-celebrated twin to Ian MacKellan's King Lear, playing in rep during the RSC's London season, is The Seagull, also directed by Trevor Nunn. Following some recent productions of this play which have interpreted the text more freely, this is a refreshingly traditional affair. In fact, positively sumptuous in its Chekhovian authenticity, this is a classical, gimmick-free production with a strong cast and an overall emphasis on characters. Trevor Nunn's direction is truly remarkable for its attention to detail. Promoting a more realistic sense of a fully functioning Russian household and estate in the nineteenth century, there are silent mini-dramas enacted by unnamed characters during the scene changes. For example, the audience are granted a glimpse of the elaborate preparations necessitated by any whim of the family, or three unnamed servants seem to play out a love triangle through glances and smiles only. Such carefully thought-out niceties included a sequence cleverly playing with the metatheatrical aspects of the play: while the men from the estate clear Konstantin's stage, others re-populate the actual stage with props for the next scene. The expansive set follows a very similar philosophy: finely specific with period detail. Although there is exactitude in abundance, it is restrained so that it doesn't feel oppressive or fragmented. Another part of this impetus towards authenticity is the translation. Developed by Trevor Nunn and then the company in rehearsal, the aim was to be as close to the original as possible, rather than allowing another artistic voice to influence the text. This has a twofold naturalistic impact: there is undoubtedly a slower pace, but this is deliberate, as if reflecting the rhythm of country life which is so often bemoaned. Also, this sense of the social surroundings helps to deconstruct the Chekhov's class focus and widen the view of society. Sharing the role of Sorin are Ian MacKellan and William Gaunt (details of which actor at which performance are on the RSC's website). On the London press night, William Gaunt took this part and performed it with expert aplomb. A most engaging actor, his Sorin is very funny with wit, humanity and flamboyant longsuffering. The audience seeing this play on a night when he stars, rather than his more famous part-sharer, should not in any way feel short-changed. Frances Barber's Arkadina was also a delight: magnificent in her vanity, but also patronizing, overbearing and attention-grabbing. Richard Goulding is a scruffily sensitive Konstantin and Romola Garai's Nina is gauche and enthusiastic, full of nervous twitches and naivety. In fact, as an ensemble piece, there is a particularly strong cast, as Trevor Nunn displays yet again his skill in extracting first-rate performances. For example, Monica Dolan's Masha ranged from quasi-caricature to emotional depth or Jonathan Hyde as the most well-adjusted character Dr Dorn, the recipient of a series of confidential vignettes. This almost slavishly traditional production returns Chekhov to its roots of gentle pathos and comedy. A product of much thoughtfulness and care, this version concentrates on the sensitive characters who are incapable of moving on and who are dazzled yet destroyed by the glorified difference between artistic creation and everyday life. Meticulously masterminded by Trevor Nunn, this is sumptuously tender, melancholic, funny and tragic. The cast for this production which is booking at the New London Theatre (Drury Lane, London, WC2 Box Office: 0870 890 0141() through 12th January 2008 features Ben Addis, Adam Booth, Zoe Boyle, Russell Byrne, Naomi Capron, Monica Dolan, Romola Garai, Richard Goulding, Julian Harries, John Heffernan, Peter Hinton, Jonathan Hyde, Melanie Jessop, Gerald Kyd, Seymour Matthews, Ben Meyjes, David Weston, Guy Williams, Philip Winchester. For other production note details see, Alexis Greene's review of the BAM production below. The Royal Shakespeare Company recently swept into the Brooklyn Academy of Music with two productions that this acclaimed company has been touring around the world: King Lear and The Seagull, both directed by Trevor Nunn. Lear, not surprisingly, has received most of the advance press, for it stars Ian McKellen, the celebrated classical actor popularly known for playing the wizard Gandalf in the film trilogy The Lord of the Rings. But it is the production of Chekhov's The Seagull that deserves the accolades. Finely staged and paced, acted with an exquisite balance of humor and pathos, and revelatory of the several layers of Chekhov's play, this is a production to be savored. Dr. Anton Chekhov began to write The Seagull in 1894. Before that, he had mostly written humorous pieces and short stories, a few of which he had adapted into farcical one-acts. One full-length play, Ivanov, had been produced in Moscow in 1887, but when he returned two years later with The Wood Demon, the critics' reactions were so discouraging that Chekhov left off playwriting for a time, traveled to Italy and to a penal colony in Siberia, and finally, because of poor health, settled on an estate fifty miles from Moscow. Always he practiced medicine. Along the way, Chekhov developed a double-edged view of the world, a habit of seeing that the pitiful was tinged with humor and that humor overlay quite a bit of human sorrow. It is a duality that director Nunn captures and never drops. "Why do you always wear black?" the timid teacher Medvedenko (Ben Meyjes) asks Masha (Monica Dolan), as he enters at the beginning of the play. "I am in mourning for my life," this Masha answers dryly, immediately getting a laugh. From that moment, the production jockeys pointedly and entertainingly between misery and hilarity. Konstantin (Richard Goulding), The Seagull's would-be experimental dramatist, tries to shoot himself, but his mother, the highly dramatic actress Arkadina (Frances Barber), immediately faints, drawing attention to herself and undercutting Konstantin's horrific act with an amusing stage swoon. And so the production goes, never letting us fall totally into despair or relax completely into gaiety. In Nunn's smart interpretation, this tension between pathos and comedy is part of what the play is about. The Seagull is about theater or, more accurately, Chekhov's personal search for the kind of theater he wants to write. In 1894 Chekhov has several options. He can write the commercial melodramas that have made forty-something Arkadina a star. He can try the symbolism of the French poet-playwrights—the style Konstantin imitates so badly in the monodrama he has written for Nina (Romola Garai), which Nina performs outdoors in Act I. Or Chekhov can invent a new style and write a play based on his observations of how people truly behave and communicate, a play that takes a sometimes compassionate, sometimes satiric view of human nature. A play very much like The Seagull. The play, and this production, is also about how an artist lives, a question that Chekhov undoubtedly was exploring for himself. Can an artist create in the country, or does one need the bright lights and people of Moscow? And how selfish do you have to be? Arkadina and her good-looking thirtyish lover, the well-known short-story writer Trigorin (Gerald Kyd), are self-absorbed: dedicated to their art and themselves. Konstantin and Nina, who aspires to be an actress, are also self-absorbed. But they are less talented artists, so less successful at demanding that the world should pay attention to them. Trevor Nunn is adept at staging elaborate and intricate productions, from Nicholas Nickleby to Les Miserables. But here, perhaps as a necessary requirement of touring, Nunn keeps the production comparatively simple. Aside from one pair of enormous double doors, there is little in the way of set decoration from designer Christopher Oram: a few pieces of furniture, and an expanse of stage that disappears into deep darkness courtesy of Neil Austin's remarkable lighting. Nunn makes a virtue of necessity. He practically choreographs the flow of actors from scene to scene, using the enormous space to refract the moods of the play. When Arkadina arrives at her country house, the space seems to fill with people, sitting around, eating and conversing. When she is gone, the enormous cold space seems to come between people, hindering their communication. The cast, filled with many young actors from the RSC, is a well-tuned ensemble, and the literal translation by Noah Birksted-Breen, adapted by Nunn and the company, provides a highly actable contemporary text. Even McKellen, who has a reputation for stealing everyone's thunder, blends in, playing Arkadina's elderly brother, Sorin, with a springy mop of gray hair and subtle comic touches. (Sorin is alternately played by William Gaunt, who plays Gloucester in King Lear.) Only Romola Garai as Nina looks out of place, a tall actress making awkward, mannered gestures, as though she were perpetually trying to be the seagull of the title. Toward the end, however, Garai's Nina is truly piteous when she confesses to Konstantin that, even after Trigorin has tossed her aside, she continues to love him. Alone and nearly destitute, Nina is, at that moment, in mourning for her life. Editor's Note: The Seagull's repertory partner, was reviewed by Les Gutman, whose review can be found here. 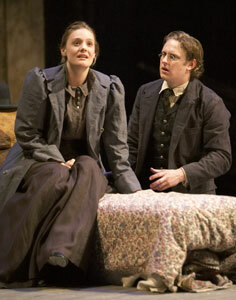 For more about Anton Chekhov and links to other plays reviewed, see our Chekhov Backgrounder. Cast: Frances Barber (Arkadina); Richard Goulding (Konstantin); Ian McKellen (Sorin); Romola Garai (Nina); Guy Williams (Shamrayev); Melanie Jessop (Polina); Monica Dolan (Masha); Gerald Kyd (Trigorin); Jonathan Hyde (Dorn, a doctor); Ben Meyjes (Medvedenko). Performances: Sept. 7, 8, 12, 14, 15, 20-22, 27-29 at 7:30 p.m.
Tickets: $30, 55, 75, 90. Reviewed by Alexis Greene at press opening, Sept. 12, 2007.